Can a knee-slapping, country-bumpkin nerd like Buford P. Fuddwhacker really do an effective job training your people? Absolutely, and generally about half-way through his training programs he removes his buck teeth, nerd glasses and beat-up hat to reveal Roger Reece. Roger lends Buford a little more credibility and conducts the second half of the program, building on all Buford's concepts and ideas to deepen the training. His somewhat more serious approach to training provides a great balance that adds tremendously to the overall learning experience. Are you looking for a keynote speaker? Why not consider one of our combo packages? Your fee for a Fuddwhacker keynote and a 90-minute training program is only about 20% more than the keynote alone. Buford will open your meeting with an enthusiastic, entertaining and motivating keynote that focuses on the topics you select. Then Roger will provide a training session later in the day, picking up where Buford left off. 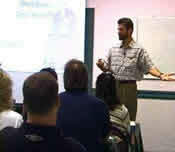 Roger's session will add in-depth teaching and challenging group exercises to the overall experience. Contact us now for more information on a special Keynote/Training Combo Package! Follow this link to the complete listing of Fuddwhacker programs.